ady Clover and Sir Dion had very fixed idea when they contacted the princess. 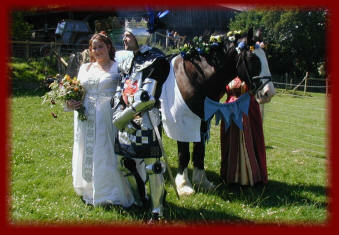 Not only did they want the whole fairytale wedding day they also wanted pole jousting and falconry and medieval archery for their guests. Again on the hottest day of the year, seems to be a trend here for the Kingdom of Fantaysia, baring in mind there was heavy rainfall either side of them in other areas but not on Clover and Dions special day. 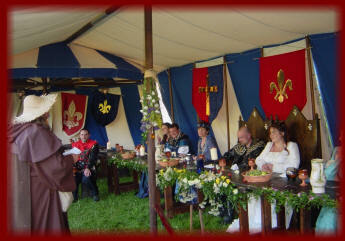 The Kingdom arranged for an on site costume service for their guests & set the scene for their special day. 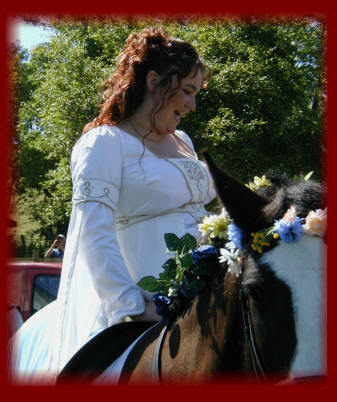 Clover arrived on horse back with flowers entwined in its mane and wearing a blue and white comparison. As her hand maidens led her to her knight everyone was so excited at the whole experience of being at a medieval wedding. They were then joined in a hand fasting ceremony and declared their love. After they posed for photographs they then went onto the fun aspect of their day including hands on falconry, archery and pole jousting, there was more than enough fun for these guests on this special day. 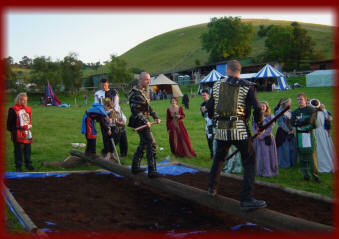 Some of the male guests (Dions friends) even got changed for the pole jousting part, to wear tunics so to save their costumes from being covered in mud. 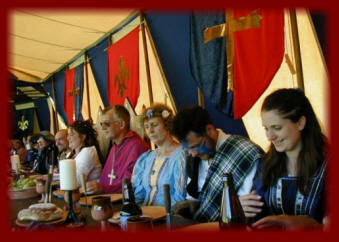 We had to put the banquet forward as they just didn't want to stop having fun, but at long last the guests were settled. Brave knights sat at their banquet table to protect them from any bad knights who may try to interrupt their special day. The jester/juggler wandered on his stilts and entertained and minstrel music played whilst the guests feasted on a hog roast served by wenches from the kingdom. Trouble transpired part way through the banquet and Dion the groom challenged a couple of rogue knights to a fight, he then part took in a small sword fight outside to see them off which was finished with a full on sword fight by the knights of the kingdom. 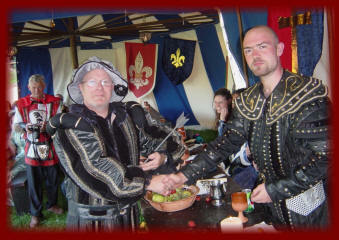 Calm was assured again & the banquet commenced, An arrow was presented to a guest who had scored the most points at archery & as the banquet came to an end. Medieval folk dancing finished the night to ensure it was a day they would never forget. 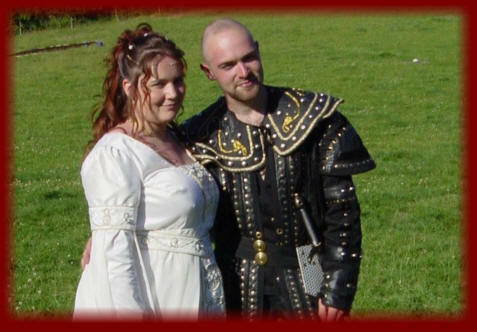 Dion and clover enjoyed their medieval day that much they joined a re-enactment society and actually came to a wedding the kingdom organised as re-enactors, it was good to see them both again and catch up. They said it was 100 times more than they expected it to be which the Kingdom takes as a great compliment.